I've lived just outside Hamburg, Germany for almost 30 years, and I've only written-up one Hamburg route so far: shame on me! (See Alster Loop route description.) 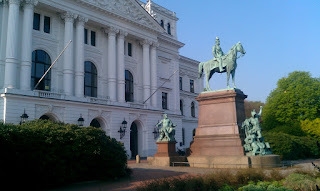 Hamburg is a great place to run, with beautiful, large parks (Stadtpark, Planten un Blomen, Wallanlage, Volkspark, etc. ), lakes and rivers, lots of tree-lined streets and elegant old neighborhoods. It's amazing that a city that was half bombed-out in the war offers so much. Here's a route that will take you through the west side of town, in the Altona neighborhood. Altona was a separate town until the 1930s. 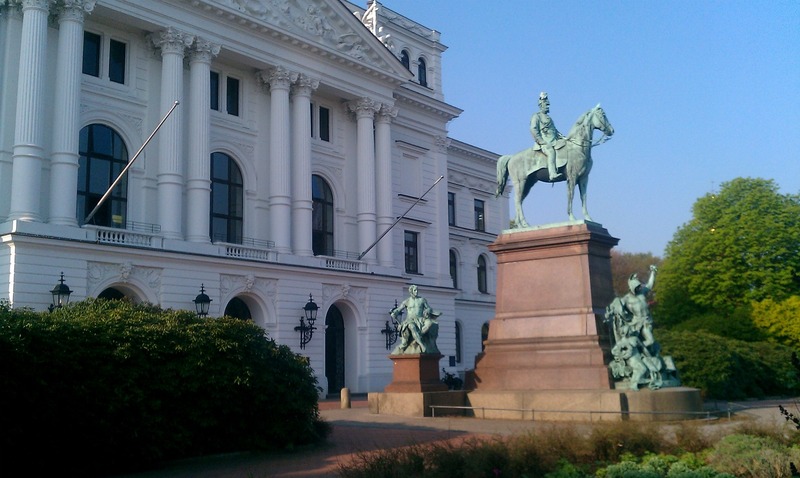 It was part of Schleswig-Holstein, built by the Danish king to compete with the Hamburg harbor. And it offers a wonderful stretch of riverside paths for some fine, scenic runs. This route is an out-and-back, starting at the Altona train station, heading to the Elbe River and then downriver through a lot of varying, interesting scenery. So, ready to start? Let's go! The south side of the Altona station borders a park called Platz der Republik. 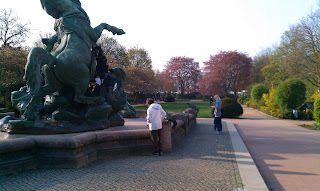 The park stretches toward the elegant old town hall and the Elbe River beyond. Just head straight out through the park, passing the gigantic Neptune fountain. 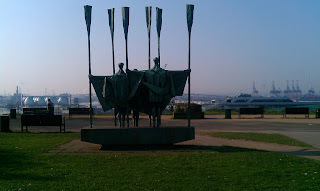 On your right side, you'll pass the Altona Museum, housing lots of ship models and old toys, then the Altona Theater. At the white town hall (Rathaus) building, stay on the right side, with the beautiful old church to the right, the Christianskirche (named after Danish King Christian VI). In the big churchyard, one of Germany's classical poets is buried, Friedrich Klopstock. Behind the town hall, you have to cross the busy street, Palmaille, which turns into the Elbchaussee to the right. Cross to the other side, then also cross Kaistraße, which goes downhill diagonally from the same corner. 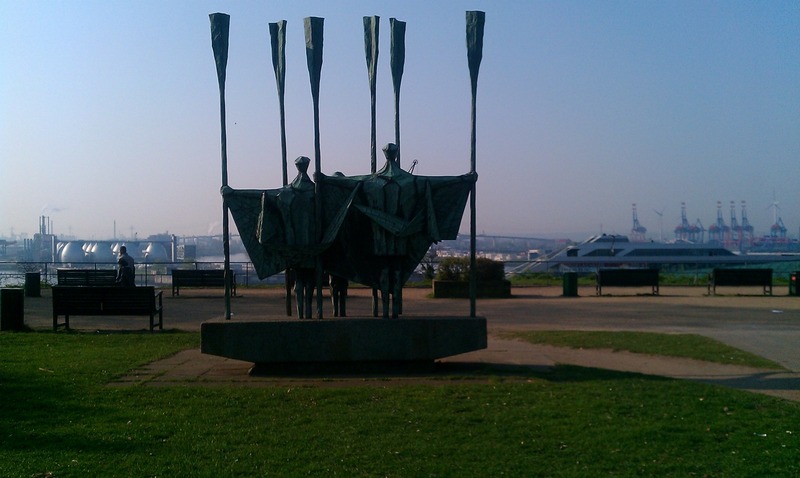 You are now in a little park high up on a bluff overlooking the river, with the harbor behind. This is Altona's Balkon (balcony). There are several such parks along the bluff. Take a look at the view of the harbor's industrial landscape across the river: cranes, mountains of containers, gas tanks, ships crawling about. As we run downriver, the scenery will get less and less industrial. Now turn to your right and follow the path as it goes downhill next to Kaistraße. 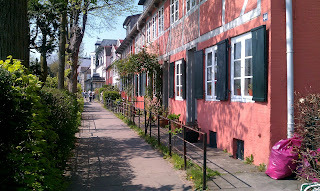 At the bottom of the hill, Kaistraße runs into the riverside street, Neumühlen, where you keep running straight ahead. You now have a choice of either running along the street, or cross it to the left to run behind the waterfront buildings, to jog directly along the water. This part of the river is lined with new office buildings and some older warehouses. After half a kilometer, Neumühlen enters the beautiful Övelgönne neighborhood. Övelgönne is full of old houses built by sea-captains, with a museum harbor full of old Elbe sailing freighters and lighthouse-ships. There are a few restaurants at the water's edge, too. The road ends at a beach, where you now have a choice of either running down along the loose sand, or turn right to go up the little lane that goes in front of all the old captains' houses that face the river. The houses all have front gardens to the left side of the lane, going down towards the beach. 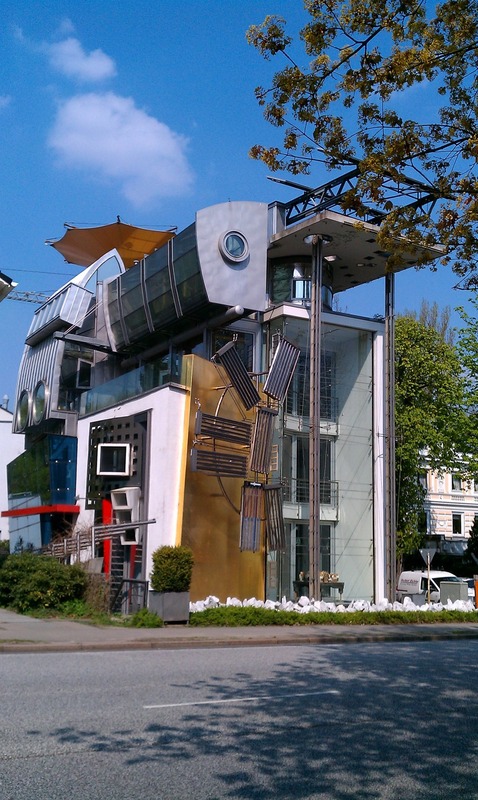 You will definitely have trouble not envying the people who live in this great spot. The lane sometimes takes a turn to the right or left, but continues for quite a while, parallel to the beach. Finally, it goes down closer to the water, and the Elbwanderweg begins. 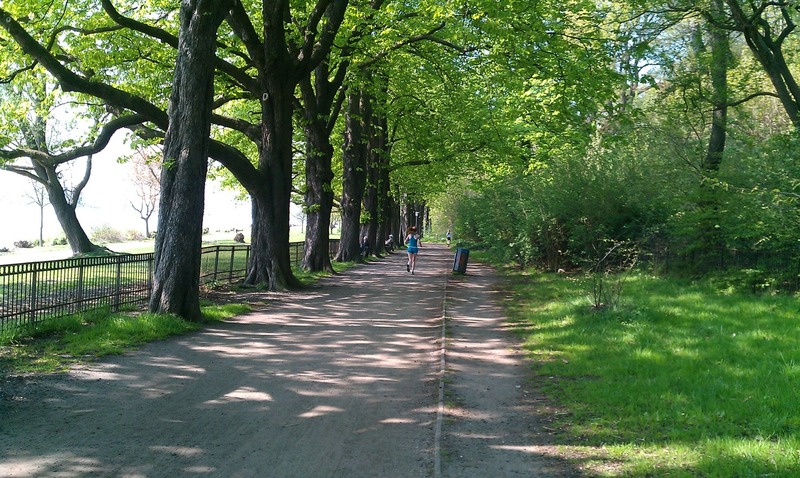 This tree-lined riverside footpath stretches for many kilometers ahead, until, west of Wedel, it runs along a dike through sheep pastures and estuary. Just past Övelgönne, you'll see a giant boulder, der alte Schwede ("the old Swede"), pushed here by glaciers and then dug up when deepening the Elbe. 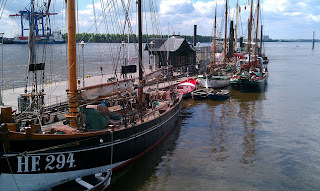 After about 2 more kilometers, the path comes to a small yacht harbor, and past it, a ferry landing, at Teufelsbrück. The path turns to the right to go around the harbor. At this point we will leave the river to cross the street, Elbchaussee, and do a loop through the park across the street, Jenisch Park. There are zebra-stripes at the crossing. NOTE: The buildings across the river past Teufelsbrück are the Airbus aerospace factory, where they build the A320 and A380. When you cross the street, take the path to the left side and follow it as it goes uphill above the small valley. 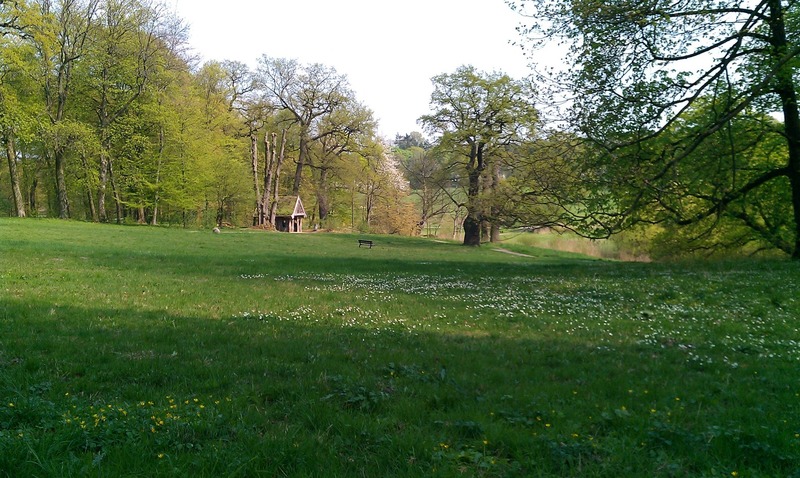 Jenisch Park was once a private park around a classical mansion. The land surrounds a stream valley, with a nature preserve around the stream, and wide lawns all around. You will soon come to the white mansion, then loop around to the right, and come back out to the same zebra stripes at Elbchaussee again. So now you just head home. You have a choice: either head back the same way you came, along the Elbwanderweg, or run up Elbchaussee. 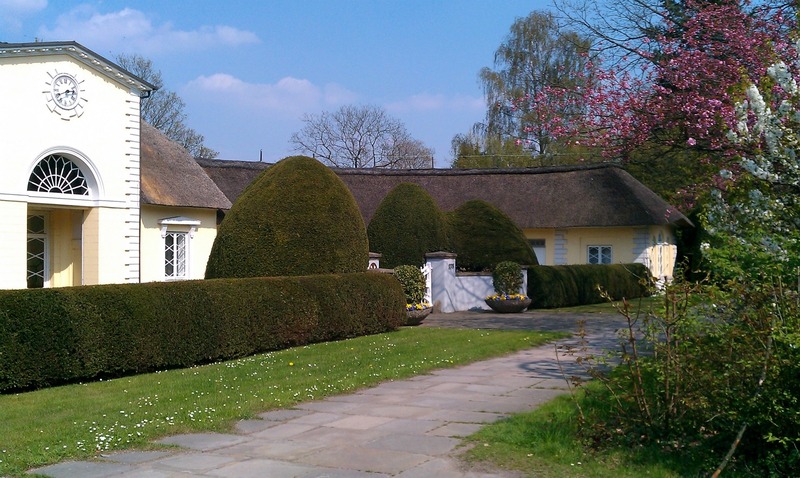 Elbchaussee is lined with big villas of every style, size and shape, and several parks, but has a steady stream of traffic. It comes right out at the corner where you crossed to the Balkon earlier. Another Elbchaussee house: not every house is classical! Whichever way you go, you won't regret it! NOTE: If you want to do even more distance, you could leave out the Jenisch Park loop and just continue along the Elbe past Teufelsbrück. 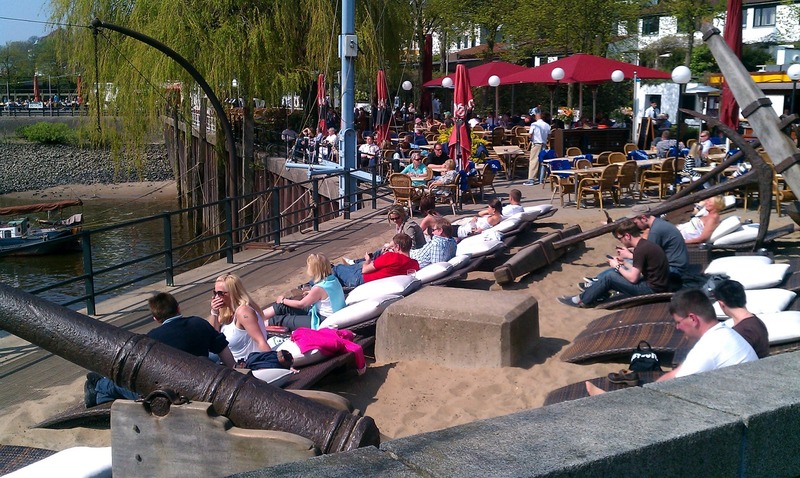 In 3 kilometers you come to Hamburg's most scenic neighborhood, Blankenese, with its hillside houses connected with a maze of stairways and little lanes: truly charming! Glad to have found this route. 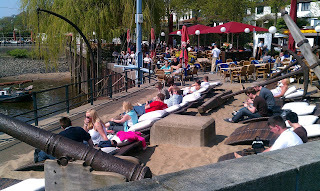 Am heading to Hamburg this weekend, and this is exactly the sort of thing I was looking for!